Staying true to the iconic styling of the Rangemaster Classic, with it’s bevelled doors and arched window the Classic Deluxe offers a host of innovative, up-to-the-minute features whilst retaining it’s traditional looks. The hotplate opens up a whole new world of possibilities combining gas with a ceramic Multi-Zone cooking surface. With 5 gas burners and cast iron pan supports it benefits from a powerful 3.5kW Multi Ring Burner which is perfect for Asian style cooking and includes the Rangemaster wok cradle as standard enabling the stable use of a round bottomed wok. The Multi-Zone consists of two ceramic cooking zones over which a durable, aluminium griddle plate can sit providing a healthy, modern cooking surface directly on the hob. The single handed ignition system leaves one hand free for cooking by easily lighting burners with just one twist of the control. If you don't have mains gas an LPG conversion kit can be requested free of charge with your cooker at the time of order. Other standard Rangemaster features such as the Handyrack in the main oven, means no more burning your hands reaching in to the oven cavity to check your roast. It attaches to the main oven door and gently pulls the roasting tray out as you open the door and will support a roast weighing up to 5.5 kilos safely. The right hand fan oven provides a large second oven cavity ideal for batch baking or cooking foods at the same temperature by maintaining an even temperature throughout. Both ovens have glass porthole doors making it easy to check on your food without the need to open the door. The 110cm version also benefits from catalytic liners in both ovens which reduces the amount of physical cleaning required to just the base and door. Featuring the upgraded Glide-out Super Grill, The Rangemaster Classic Deluxe benefits form a deeper grill pan which glides smoothly out on telescopic runners, making it easier to safely check on your food by eliminating the risk of pulling the grill pan out too far. The new and improved four-way trivet offers greater flexibility and increased cooking capacity with four different height options to suit every type of dish. The dual circuit grill also has both full and half grill settings for both ease and economy. The Classic Deluxe 110 also includes a proving drawer which enables a controlled, warm environment with slots in the base that allow warm air to flow in and prove dough perfectly. This could also double as a storage drawer if desired. 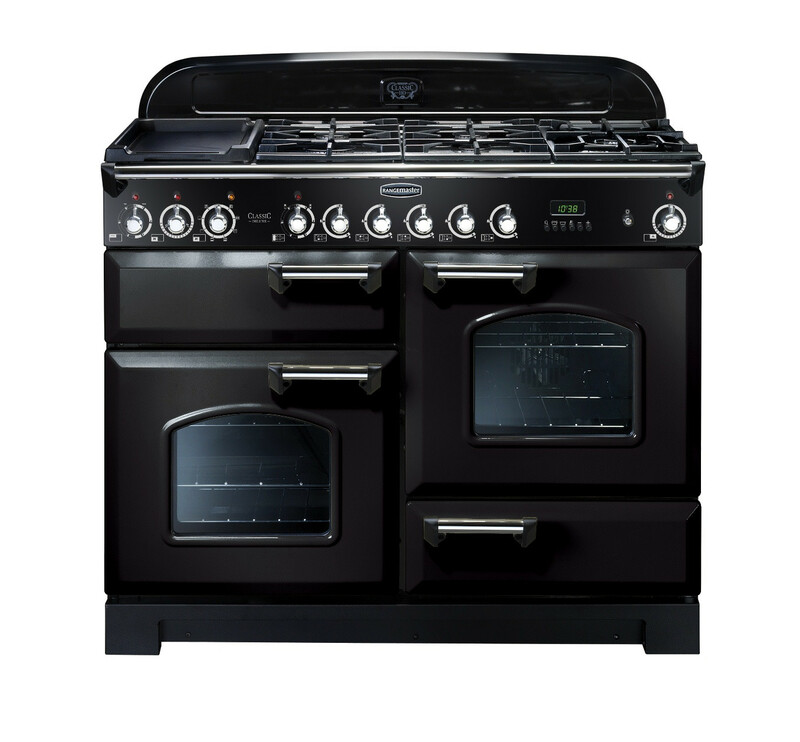 Available in a wide selection of colours there is a Rangemaster Classic Deluxe 110cm Dual Fuel Range Cooker which will look perfectly at home in any kitchen. Choose from an extensive colour palette of black, cranberry, cream, white, royal pearl, olive green, regal blue and racing green combined with a choice of chrome or brass trim.